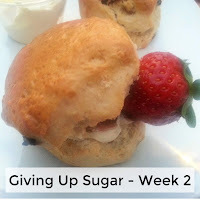 I'm very pleased to have got through and survived week 1 of giving up sugar for lent, but it has been a lot harder than I expected and I'm beginning to wonder if perhaps I ate a lot more sugar than I realised. So far, I have not cheated at all, despite the headaches, which I'm really pleased about, but it hasn't been easy. I'm still having small amounts of sugar in some meals, but I have stopped eating all sugary snacks and soft drinks, which has meant I've needed to really think about what I am going to eat. 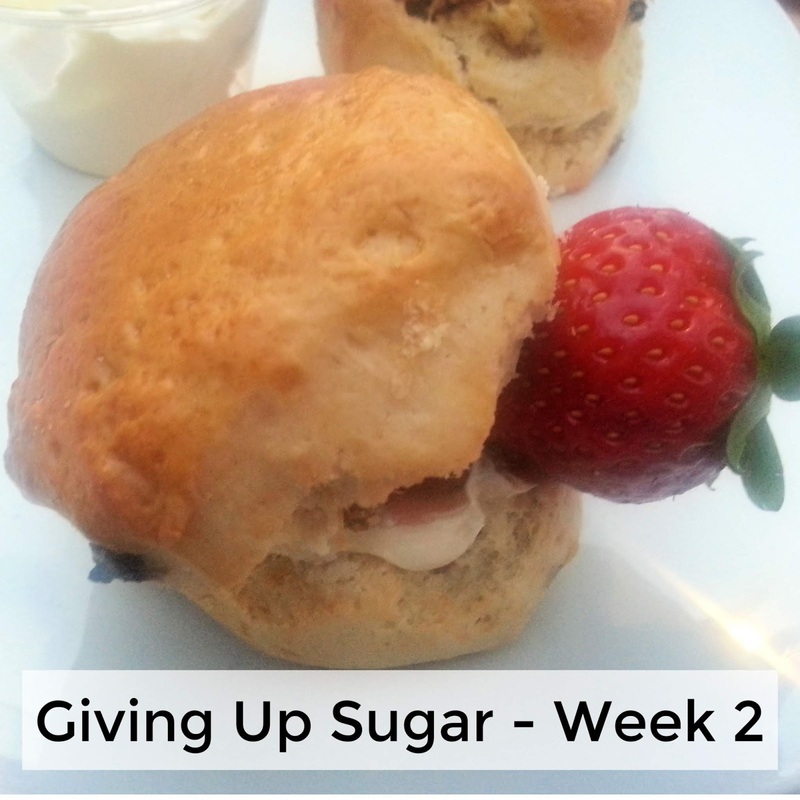 Week 2 has been a lot more stressful than week 1, with a lot of different challenges and this is a diary of how I coped with the side effects of giving up sugar during week 2. Day 8. Today I had the dentist, and it did not go well. After a really hectic morning, I completely forgot to have any breakfast. It takes ages to get to the dentist on the bus and by the time I got to my appointment I was hungry. I was also early, so I went to KFC to order a drink. They only had fizzy drinks on the menu and since I had no choice, I thought I might as well go the whole hog and ordered a cherry Pepsi Max. This is a drink I used to really enjoy, but I couldn't finish it. It tasted overwhelmingly sweet and gross. Times are definitely changing! When I got to the dentist, the appointment took ages and was not straight forward. There was a lot of heavy drilling and it was very uncomfortable, so by the time I left my blood sugar had dropped and the bucket headache had made an early appearance. I was also shaking quite a bit and feeling generally unwell. I got a lift home and had a protein shake, which helped a bit, but I felt unwell for the rest of the day. On the plus-side I didn't feel much like snacking on anything, although I'm sure before I started this challenge, I would have tried to find something sweet I could eat. Day 9. I woke up in the morning with a horrible post-dentist taste in my mouth and I was really struggling not to eat every sweet thing I could find to make it go away. Conversely, the pain meant I didn't feel like eating anything substantial until lunch. I did try a little cloudy lemonade (sugar free) to see if it would help, but it just made the pain worse, so I resigned myself to not being able to do a lot about it. I was feeling shaky again by lunchtime and it became clear that I needed to eat more regularly to keep my blood sugar steady, if I wanted to succeed at this. I work from home, so it's been hard to assess my mood over the course of the last week or so, but I have found myself shouting at inanimate objects more than perhaps is considered reasonable in the last few days. Obviously, laptops, phones etc are fair game, but even the microwave wasn't safe from my wrath. Yes, I work alone, I have no idea what the neighbours must think. Day 10. Teeth still hurting, which is making everything a bit more stressful. However, I do think I started to feel a bit more normal today. I'm getting more done, because I'm more awake than I have been and the headaches that were a big feature of Week 1 are becoming much less prominent and only for a short time in the evenings. I'm disappointed that I haven't seen many positive changes so far. I am still seeing a lot less bloating and I feel a bit lighter, but I had hoped to start to see some of the improvements I had read about, such as a brighter complexion and more energy. My energy level is almost back to normal, but it's definitely not better. Hunger is also becoming an issue, so I've started having a little natural yoghurt in the evenings. Day 11. I was up uncharacteristically early today, for a new washing machine, which seemed easier than I would normally find it. Although my energy levels are almost back to normal, I'm finding I get really tired a lot earlier at night than I used to. This means, instead of staying up til 12.30-ish, I'm struggling to make it to 11. I guess the knock-on effect of this is that I will be more awake in the early mornings, which can't be a bad thing. I stayed awake all day without to much effort too, so perhaps the tide is finally beginning to turn. I am still suffering with my teeth, but I think the sugar free headaches have pretty much gone now, too. I'm really finding the hunger pangs a problem, though. I had hoped I could curb my snacking habit, along with ditching the sugar. I'm still hoping this will happen in time, so I'm just having yogurt with seeds or a few nuts, to take the edge off the hunger until mealtimes. Day 12. Sunday was really busy, as I had L's 13th birthday to prepare for. I didn't wake up as early as yesterday, but I did wake up earlier than I normally would. I would love to be an early riser, so this is very promising for me! I went to the gym with L and did more cardio than I usually do without really noticing, so I wondered if I might have more physical energy now. L had a muffin in the cafe after, and I had tea, which was still gross. I did think perhaps it was tasting stronger, because my tastebuds have been liberated, but I think they just make bad tea. 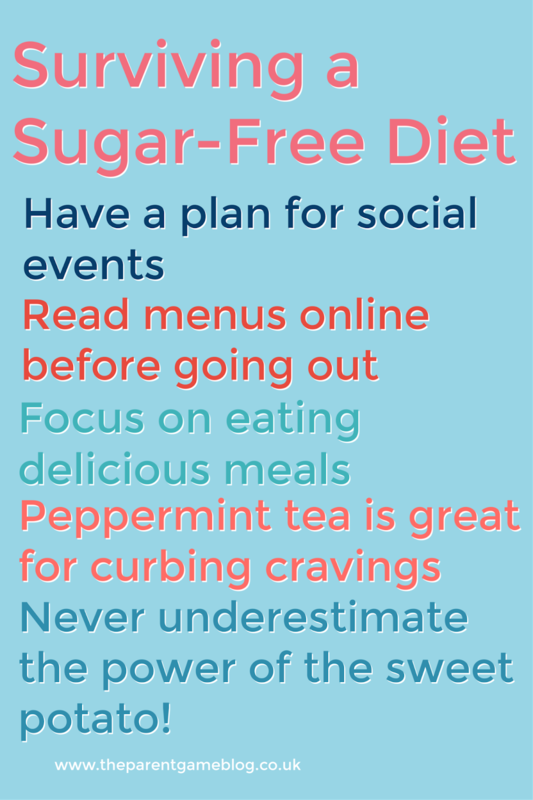 Giving up sugar is a lot easier if you can plan ahead, so I need to think of more sugar-free drink options for when I'm out and about. Day 13. Thirteen might be unlucky for some, but I had high hopes. There are two birthdays during Lent, mine and L's. 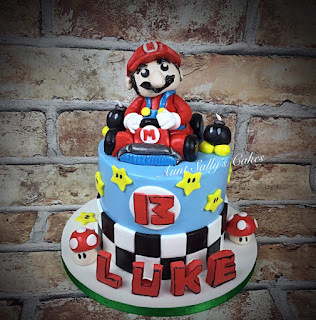 I had agreed with myself at the start that I would take those days off, because I didn't want to be a party pooper and a friend (Aunt Sally's Cakes) was making L a very special cake, which I really wanted to be part of. Today was L's birthday and there was a lot to do. I was rushed off my feet all day and barely even thought about food. I didn't have any sugar all day, as normal, until the party started at 4pm. 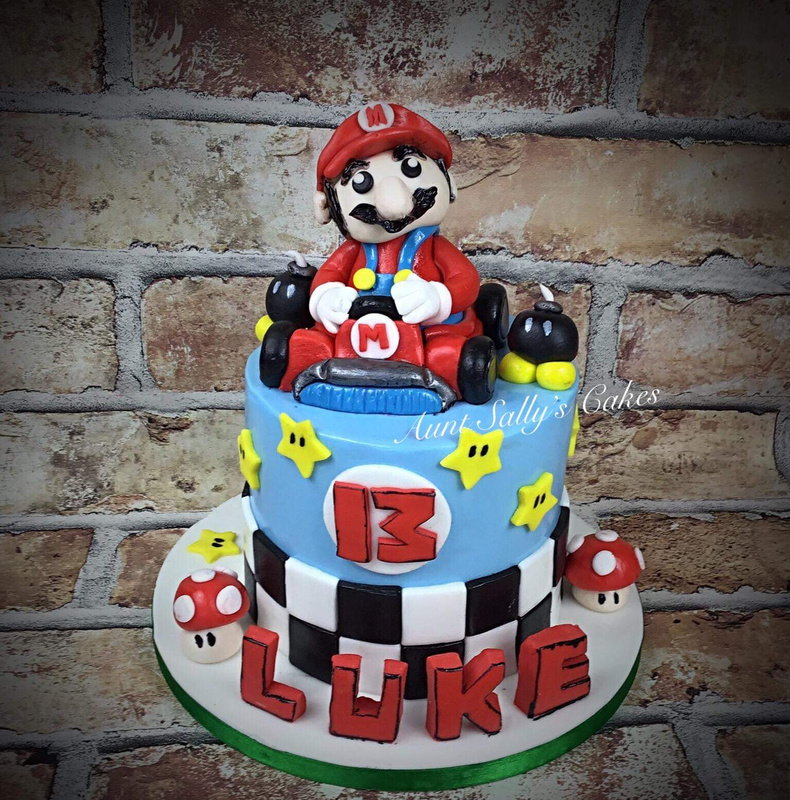 I had about five chocolates and a piece of the incredible Mario cake that we had all been anticipating for some time. Oh, and a couple of biscuits. Two thoughts occurred to me afterwards. Firstly, everything tastes incredibly sweet now. I could not have managed any more cake and I am a lot fussier about which chocolate tastes good too. Secondly, even though I had planned this break since the start (if you give up things for Lent for religious reasons, you may be aware that you don't have to include Sundays or feast days, so I could call this one of my Sundays! ), I still felt a bit like I'd failed, maybe not for trying the cake, but for succumbing to other treats too. It reminded me that I really need to get a handle on eating more regularly, as I know it was mainly hunger that caused the chocolates and biscuits to disappear! Day 14. It's the end of Week 2 and today has been one of the hardest days I've had so far, in terms of resisting temptation. My kitchen is full of leftover party food and it would be so easy just to pick something up and pop it in my mouth without even thinking about it. Particularly as I am still suffering from something that appears to be hunger, but I'm not sure if it is. In order to combat what I thought was hunger, I've started eating a more substantial lunch than I normally would. Today I had three slices of pizza, left over from yesterday's dinner. They were big slices and I wasn't sure if I would be able to finish it. However, when I did eventually eat it all, I seemed to still be hungry, which really isn't possible. I think perhaps this is where I'm missing the sweet stuff and the hunger pangs are a kind of craving, or something. I had a few cashew nuts, but I could barely manage them, as I was full from lunch, so it must be a more of a craving. It's very confusing. Are you drinking enough? Just a thought. If you're thirsty your body could be mistaking thirst for hunger, and drinking will fill you up too. As far as more sugar free drink options, it's always worth asking if they have any other teas - a surprising number of places do offer peppermint or fruit or green. There are plenty of easily available sugar free cold drinks as well, though then you're in the grey area of artificial sweeteners. If you like milk that's an option too, it's got sugars but they're natural (you could have it hot and frothed). There is always water, of course. I've always liked cold water but used to hate hot water. In my late 20s I suddenly grew to like it and these days I drink a LOT of just plain hot water! Actually if you're desperate that's an option too - carry around your own tea bags and order hot water. Wow you can be so proud of yourself, that's a great achievement, and much harder than most people would suspect! I'm just wondering what you meant by headaches, you got them from not eating sugar? Keep it up! Sugar might actually be the hardest thing for me to give up. I could give up meat before sugar. You have to be very strong to give up sugar, and you have it. That challenge is a tough one - I can't imagine here where am at, which food or snack I could take that doesn't have much sugar... But honestly, what you are doing is admirable and a good call. Congrats! that is fantastic! Giving up on sugar is the best thing to do. My body loves it and I forever thankful for this decision. 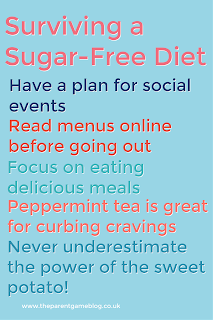 sugar-free challenge - with my sweet tooth i know i need to focus on at least reducing it so kudos to you on this success!! Well done to you it’s one of the hardest things to do. I did it for a month about 7 years ago. It got easier on week 3. I felt great for the last week but it was too much hard work to keep it going. Giving up sugar is such a big thing. Well done for keeping going! I don't know if I could do this. I like how you made this diary style. Then others can read it and get inspired on how to do it themselves.